In seeking visual order, cities are able to chose among three broad alternatives, two of which are hopeless and one of which is hopeful. They can aim for areas of homogeneity which look homogeneous, and get results depressing and disorienting. They can aim for areas of homogeneity which try not to look homogeneous, and get results of vulgarity and dishonesty. Or they can aim for areas of great diversity and, because real differences are thereby expressed, can get results which, at worst, are merely interesting, and at best can be delightful. This was to be a story of revolutionary thinking, bold planning designs and theories guaranteed to reshape the urban landscape for the better in the early 1960s. Jane Jacobs published The Death and Life of Great American Cities in 1961, releasing into the world an open criticism of modern urban planning and a laundry list of reasons why American cities were struggling more than Edsel sales. The New York Times heaped praise on Jacobs' work as if it were an empty plate on Thanksgiving day, and urbanists tripped over themselves elevating the book to Bible status; with such a warm reception, it was entirely possible to right the wrongs of recent planning disasters and return to policies that served people instead of cars and capitalism. As for the architectures built on the [Adriatic coast], their inspiration came unmistakably from the capitalist world. 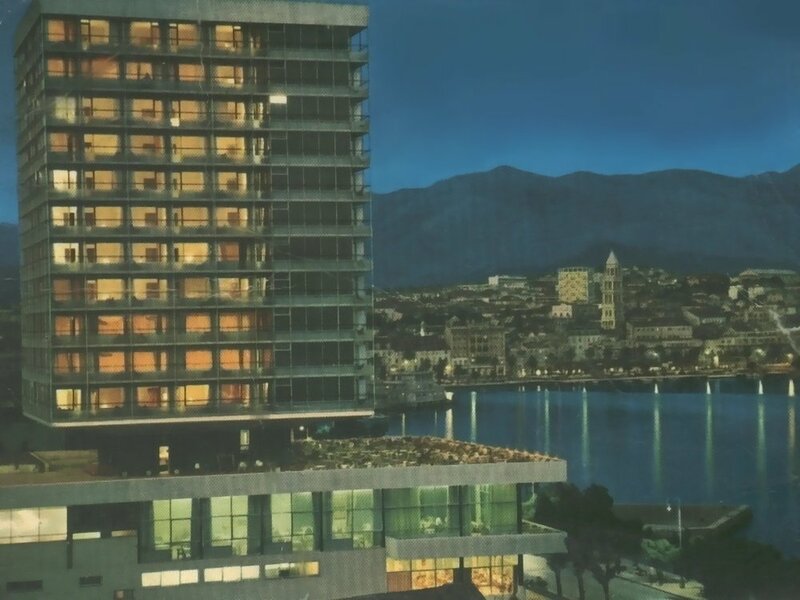 Modernism — in a simplified version [and] also as a sophisticated expression like that adopted by Adriatic architecture, such as the hotel Marjan in Split (1963), reminiscent of the Hilton Teheran, built in the same year) — represented the major referent for the first period. But it was not the only one, since in Yugoslavia it was soon paralleled by structuralist principles which allowed a more sensible attitude towards the landscape, as well as an efficient response to the increasing demand for accommodating capacity. 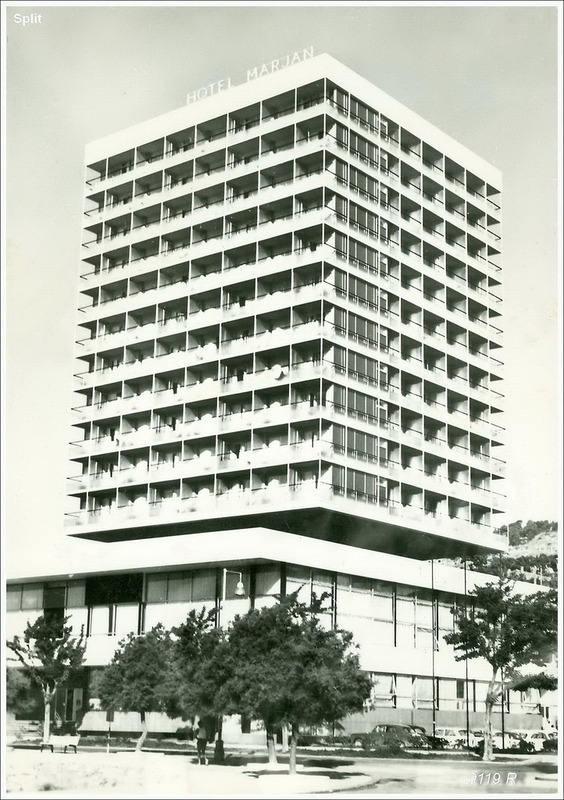 By the time Hotel Marjan was complete in 1963, locals rejoiced at the arrival of this modern facility, a symbol of efficiency and a byproduct of new concepts like centralized five-year planning and state controlled economies that emerged following the country's transition from communism to socialism in 1955. Within a handful of decades, though, the sheen of modern architecture had worn off and Marjan's over-sized and impersonal structure proved unable to adapt to the current needs of the community (not to mention locals had grown wary of unchecked mass tourism). 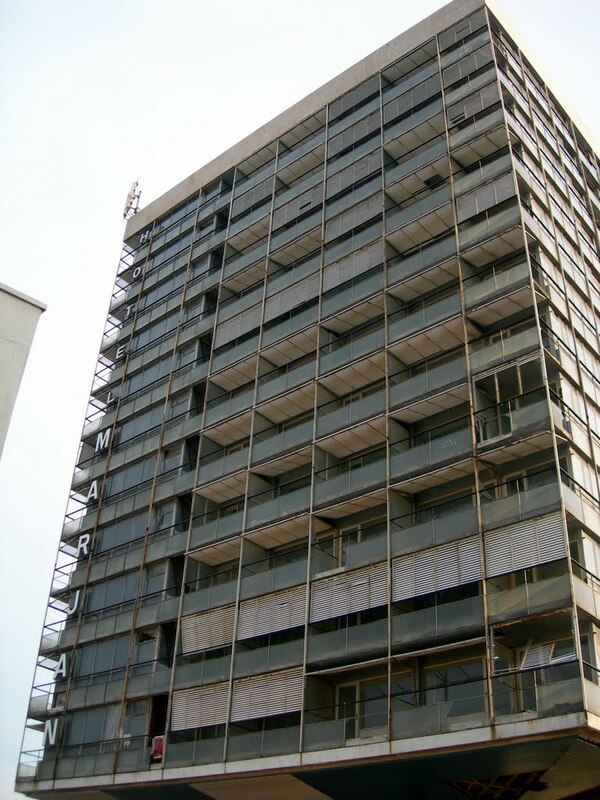 By 2006, the year Jane Jacobs passed away, Hotel Marjan was in the throes of death, and by 2009, its hulking frame had been completely stripped and laid out for a pre-interment viewing. In 2017, it's unclear what the future holds for Jane Jacobs and Hotel Marjan, two key players in modern urban planning who have left lasting impressions in the field. Jacobs, whose simple theories are needed today more than ever, has mostly been reduced to a chapter or two photocopied, stapled, and passed out to college students as coursework filler, a name whispered nostalgically while eyes mist thinking of sidewalk ballets, principles pushed aside in favor of trendy autonomous cars and pop-up shops; Jacobs has become a near-mythical creature whose sensible suggestions have yet to be fully embraced by American planning. And Marjan's fate? Well, that's a bit more complicated. There’s more to Hotel Marjan than its stern glass facade and concrete frame suggest, a history beyond the acrid stench of cat piss and floors littered with discarded needles that greet visitors today. 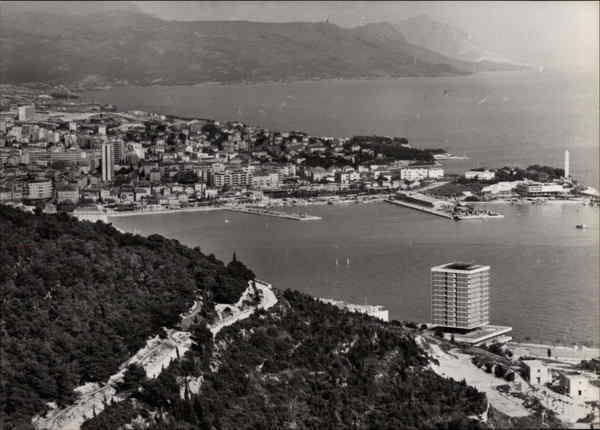 The hotel opened at the height of Yugoslavia’s glory days with 220 rooms, nestled below the peninsula's Marjan hillside park and complete with an outdoor pool on the roof and balconies in every room. 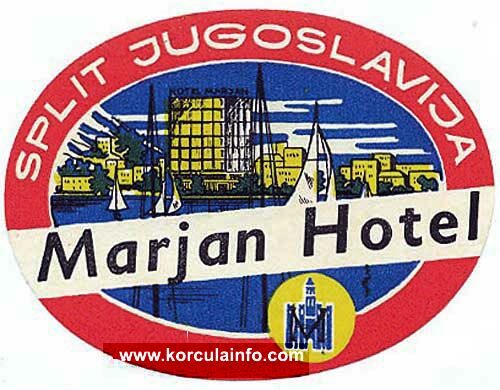 By 1966, Hotel Marjan was so popular that the property expanded to add a large western wing with an indoor pool and other amenities to accommodate the never-ending stream of visitors to Split. 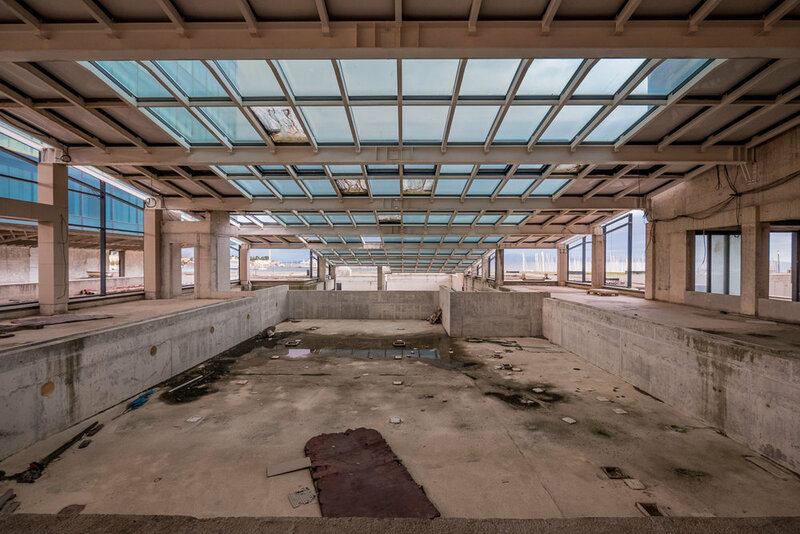 And with the city hosting the Mediterranean Games in 1979, Marjan again expanded, but this time on a larger scale, adding 110 rooms, a conference center, and commercial spaces to the east side. 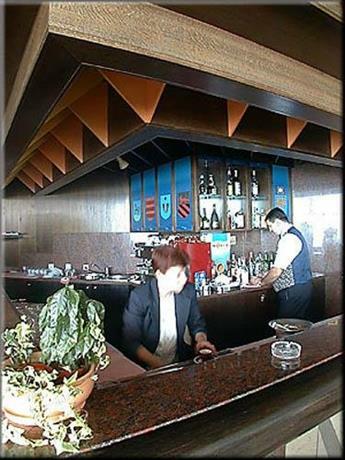 (The hotel was crucial to the event, serving as the Games' main press center and possibly good luck charm, as 1979 was the only time in the Games' 66-year history that Italy or France didn't win.) 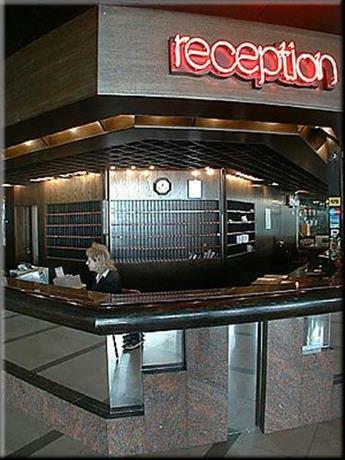 “It would be difficult to enumerate all the dignitaries, statesmen, Nobel Prize winner, or the size of sports scientists that this hotel had the honor of hosting,” states the website of the real estate company today doing its best to paint a cheery portrait of a building that hosted the UN as recently as 2006 but made international headlines ten years later as a drug lair. Marjan's apparent savior Kerum turned out to be flimsier than the hotel's Soviet-style plywood headboards, although his pledge to invest another 130 million euros in the property seemed sincere at the time. 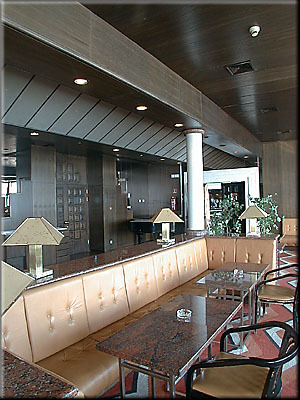 Kerum closed the hotel in 2008 for "temporary renovations", claiming that Marjan's refreshed look would propel it into the strata of world-class hotels. 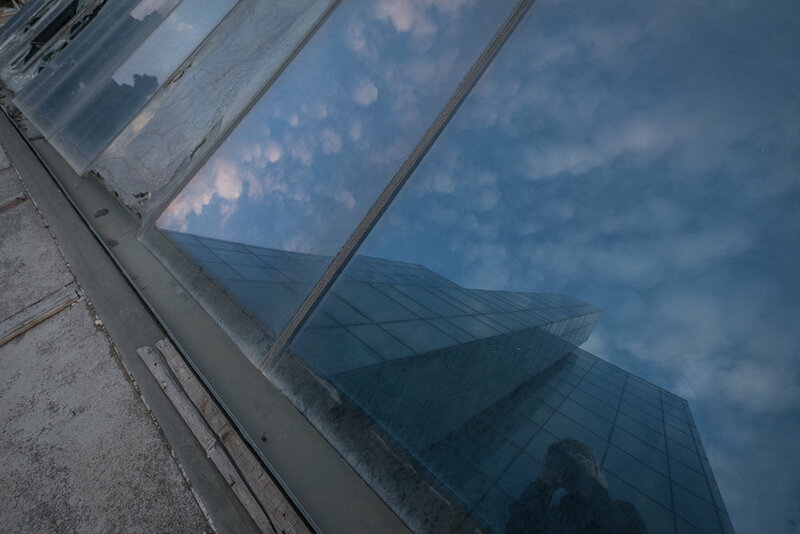 Construction workers proceeded to strip all 50,000 square meters of the facility down to a concrete shell, then glassed in the tower and began an elaborate fit-out for the ambitious luxury property. 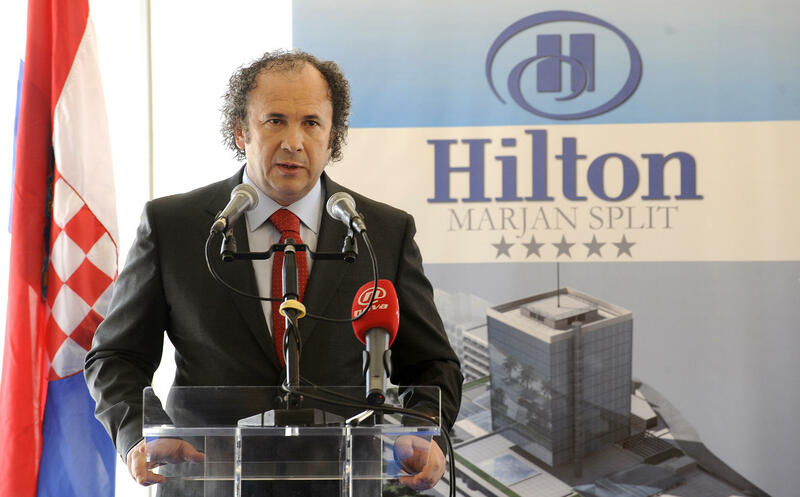 By 2009, the future looked particularly rosy for Hotel Marjan: Kerum signed a franchise agreement with Hilton and promised to complete the project before the next tourist season. For those of us with basic mathematical skills, that's seven tourist seasons ago that the Hilton Marjan Split should have officially opened for business, prompting us to believe that Kerum's grandiose plans are indefinitely stalled. 10,000 square meter basement garage, 300 parking spaces, 268 hotel rooms, 29 suites, 20 elevators, 16 residential flats, 1 Presidential Suite; a real estate company's website still urges readers to "Reserve your space in the future exclusive Hilton Hotel, the most beautiful location in the city of Split. Do not miss the opportunity, space will be rented quickly." But don't be fooled, because nowadays Hotel Marjan sits like a decommissioned battleship docked outside of Diocletian’s wondrous 4th-century AD palace ruins. When I first saw Hotel Marjan’s squat tower in the distance, I thought it was just another spectacularly unspectacular modern building, likely a hotel but potentially a bank or office building. I didn’t think much of the building until I walked past it one day, realizing it was not a half-finished new hotel but a ginormous facility, really seven buildings smooshed under one large, leaky roof. Getting inside wasn't difficult thanks to a few doors left wide open, something of a surprise considering how dangerous the site is. 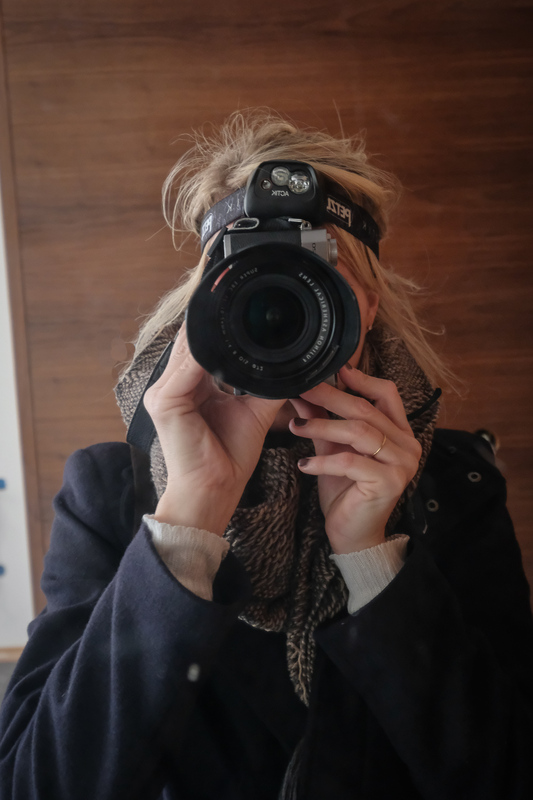 Past the piles of excrement that very well could have come from a herd of wild ponies, I had to watch where I stepped as the building was dark, wires hung from ceilings, tubing protruded from floors, and few of the many dramatic drop-offs and elevator shafts were protected. Granular chunks of broken safety glass from skylights littered the floor and the foundation was flooded with water, death knells for abandoned buildings. Interestingly enough, apart from the spiral staircase and a room full of accounting binders that had been sprayed by a clowder of territorial cats, any evidence of Hotel Marjan's glorious past had been obliterated (I first explored the building thinking it was new construction). The current status of the complex is unclear, although a recent news article claims a small section of the complex was sold to a developer for apartments; more news and recent interior images are here and here. A car rental company now occupies part of Hotel Marjan and its few employees busy moving cars around keep most loiterers away, but its presence has done little to revive the hotel. Walking through the building, I thought about what a colossal waste Kerum's project had become. Sources claim Croatia's Trump invested more than 113 million euros in the project and was looking for another 20 million to finish the project when it halted in 2011, insane amounts considering what Kerum had spun his gold into. 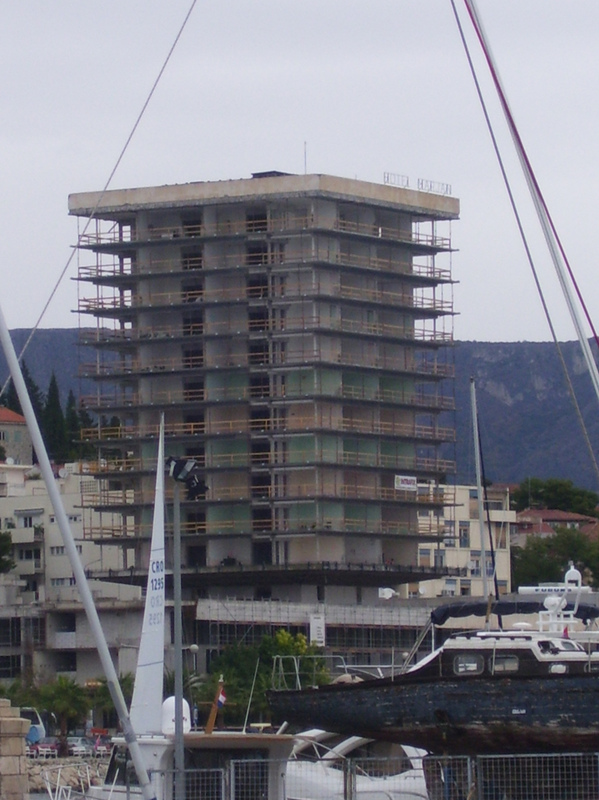 Reflecting on the project, I can't help but ask if such a grandiosely bellicose project was really necessary, for the sake of Hotel Marjan or the city of Split. I came to the conclusion that, using Jacobs' own words, the original Hotel Marjan was depressing and disorienting, and the planned Hilton Marjan Split was vulgar and dishonest; both represent high-maintenance, pedestrian architecture with a shelf life shorter than lettuce. As much as I'd like to say that Hotel Marjan will maybe one day take on a life of its own when a compact city springs up from its ruins as it did with Diocletian's Palace, the reality is that Marjan won't last another fifty-four years, much less seventeen hundred; Diocletian nor Jacobs would approve.